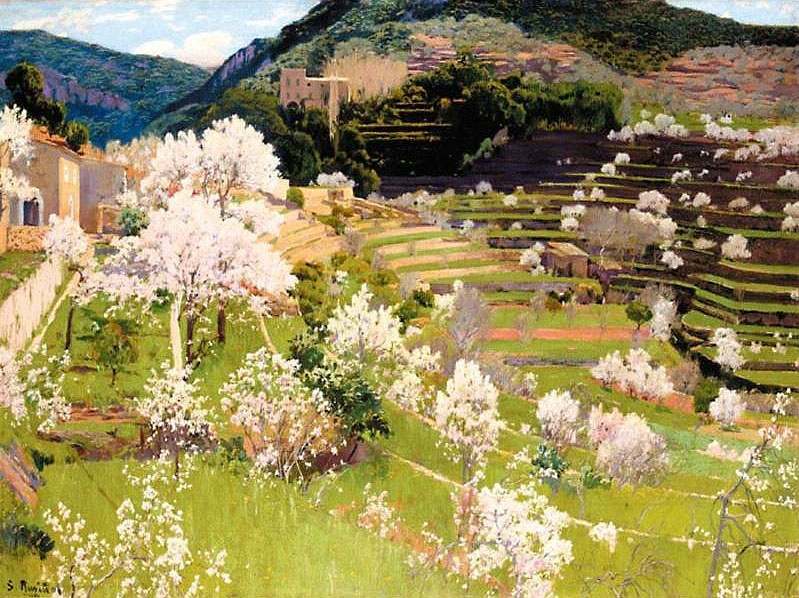 Santiago Rusiñol i Prats (1861-1931) was a Spanish painter, as well as a poet, playwright, and occasional architect. A native of Barcelona, he was a major figure in Catalan modernism. 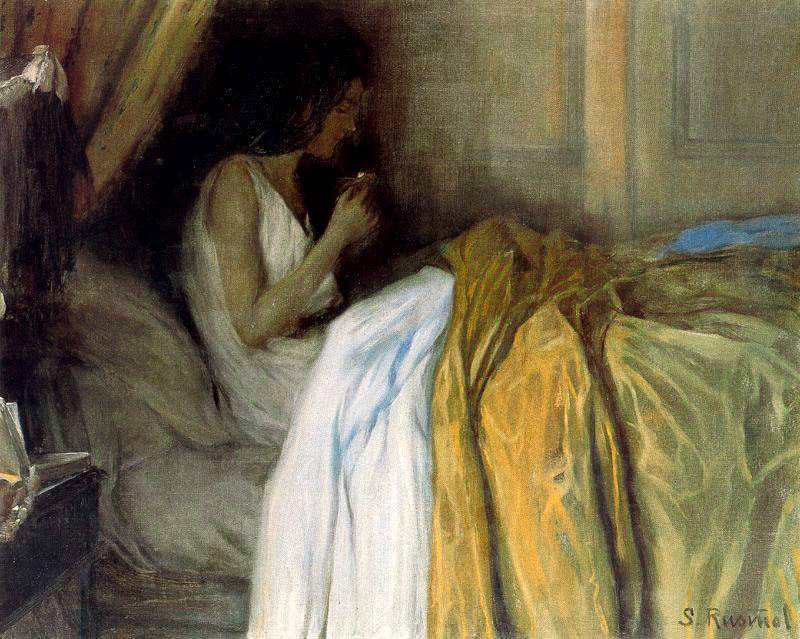 Rusiñol began his artistic education at the Centro de Acuarelistas de Barcelona. 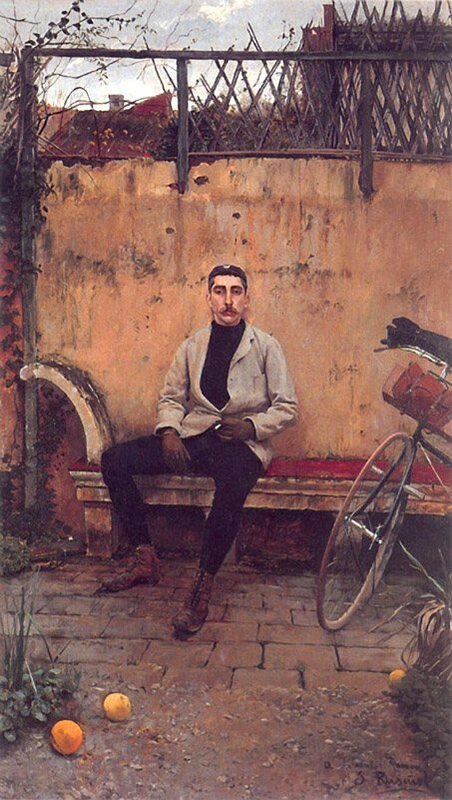 In 1889 he traveled to Paris to further his studies, where he lived in the artistic community at Montmartre. He is perhaps best known for his landscape and garden paintings, but in my opinion his figure paintings are more effective. He depicts his subjects with great intensity and compassion. 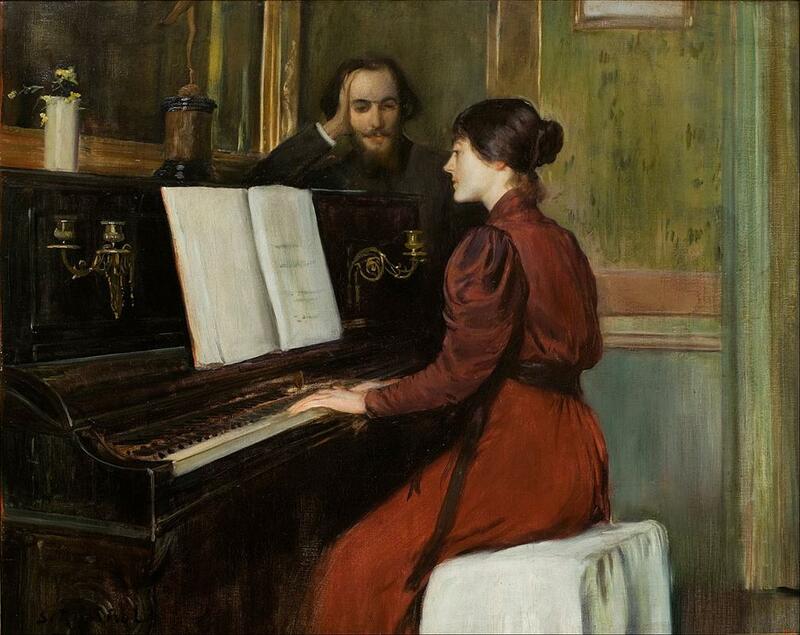 The painting I have featured is a beautiful example of Rusiñol's work in Paris. The Moulin de la Galette is the windmill at the top of Montmartre. It has had a wide range of uses and associated businesses, but in 1890, and today, it was the home of a popular restaurant. 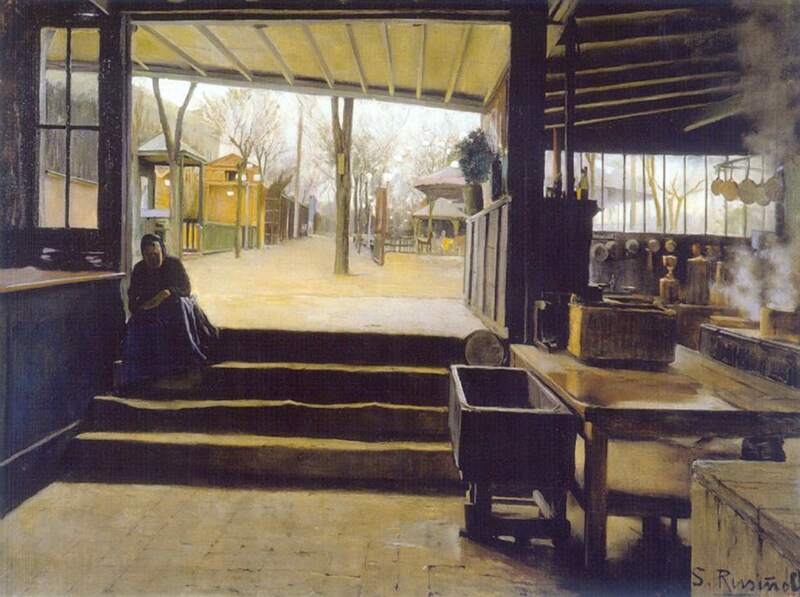 Rusiñol also did a painting of the kitchens there. This painting of the ticket seller is a fascinating study in space and figure. The setting of the walkway recedes away from her, creating an odd perspective and the sense that she is standing quite close to us. 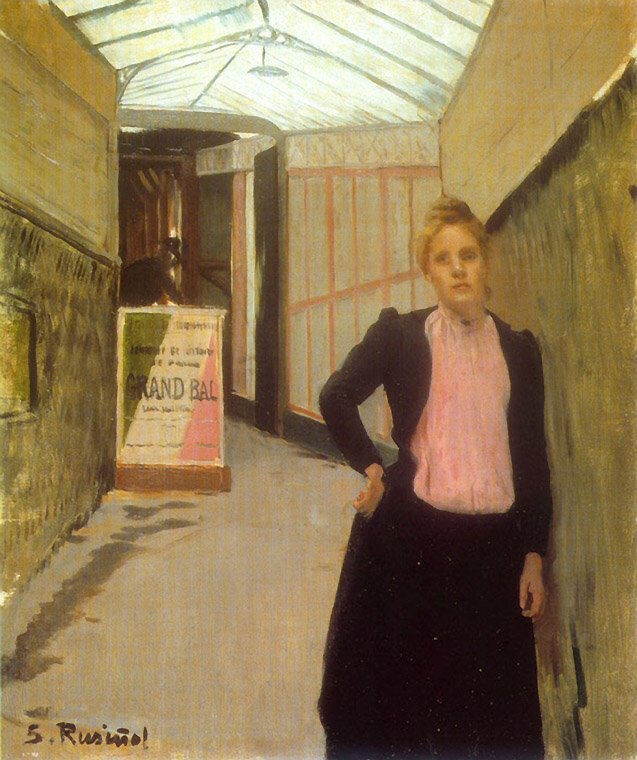 The colors of the ticket seller's garments are present elsewhere in the painting—the black appears in the dark parts of the walls and the pink on the sign to the left. This makes her appear like a fixture of the scene, an indelible part of the Moulin de la Galette. She herself appears somewhat weary of her job, but engaged and resolute. She is a figure of great visual interest, almost meeting the viewer's gaze. She also occupies the same function she did in life—restricting access to the destination beyond her. As viewers we cannot penetrate the space and give her our tickets to enter the windmill. Instead we remain on the outside, this young woman our only interface with the attraction.